It is not often that two siblings excel at the same sport. It is rarer still that both are good enough to merit the attention of top-tier athletic programs. And for both to commit to the same school is nearly unheard of. It is the story of sisters Teegan and Annika Van Gust, Fayetteville, Ga., natives who have led the Jackets in a variety of statistical categories. Entering their final year, the stakes are high. 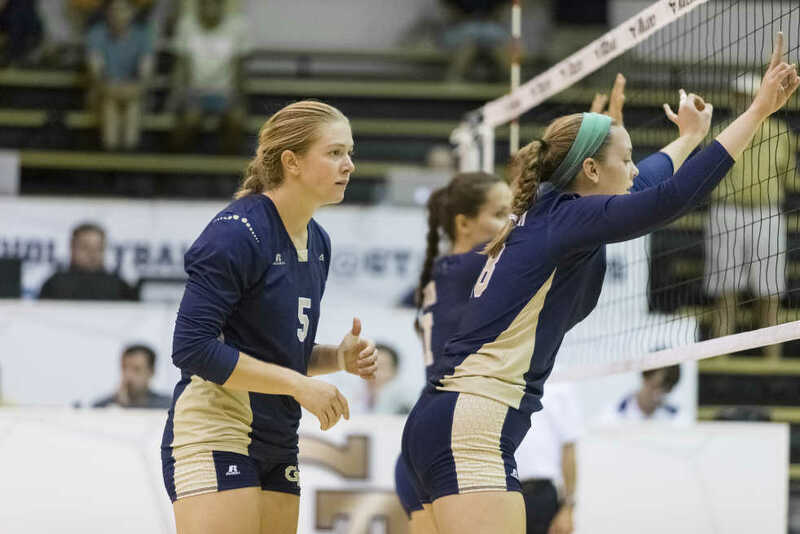 With head coach Michelle Collier at the helm for her third year, the Jackets have spent the spring preparing for a fall season full of broadcasted games. Tech volleyball will be televised 18 times this season, 10 of which will be home matches. Collier was an incredibly successful player in her own right. As a collegiate athlete at the University of South Florida, Collier ranked fifth all-time in Division I with 2,729 kills, courtesy of ramblinwreck.com. The Gold/White Scrimmage was the first chance that Tech fans got to see the Yellow Jackets in action. Coach Collier explained to ramblinwreck.com that she was pleased with the performance at the scrimmage with the Gold team winning all five sets with five different lineups. This season, every member of Tech’s starting lineup is returning along with some new talent. Freshmen Emily Becker, Kodie Comby and Simone Spencer made their debut at the scrimmage and seem to be meshing well with the rest of the team. That bodes well for their chances of earning a significant role on a team loaded with experienced athletes. The group got in a bit of bonding time on their trip to Brazil this spring where they competed against some of the Brazilian club volleyball teams. The benefits of this trip were apparent at the scrimmage, with Tech’s teamwork solid throughout the match. Tech ended last year in the middle of the pack, No. 9 in the ACC. The Jackets finished 18-14 with nine ACC victories, the first winning season since 2012. With a record of eight straight victories last season, the Jackets also tallied the longest winning streak since their 2006 season. In addition to excellent performances on the court, Tech volleyball earned exemplary academic marks, contributing to the school’s high ranking among NCAA athletic programs in terms of classroom success. To close out such a successful season, three team members went to tryout for the US Women’s National Team: Teegan Van Gunst, Sydney Wilson and Gabby Benda. Senior Teegan Van Gunst is quickly becoming a household name in collegiate volleyball. Selected to play for the U.S. Collegiate National Team, Van Gunst has made a name for herself in the ACC. She is first in the ACC in kills, and kills per set, second in the ACC in points per set and started in every set last season. Teegan and her sister Annika, who is second on the team in kills and kills per set, are two of Tech’s most powerful players. In addition, Simone Spencer will look to join the top ranks of Tech volleyball, joining Annika on the right. Learning alongside one of the two team leaders will no doubt play a key role in Spencer’s development. After leading the team in blocking with 126 blocks total and breaking Annie Czarneckis’s 2012 record of 123 blocks in a single season; junior Sydney Wilson is returning as middle blocker. Wilson will look to earn a spot on Tech’s single season record list with 130 blocks this season. Senior London Ackermann is also close to claiming a spot in Tech’s record books; last season Ackermann led the team in digs and digs per set, earning her the sixth spot in the ACC in digs per set with 4.16 digs per set. This season, she is 20 digs away from earning a coveted spot on Tech’s all-time top ten list. The Jackets get back on the court with four tournaments to start the season. The Jackets take on Auburn, Pacific and Furman at the War Eagle Invitational this weekend. Next weekend Tech is off to Manhattan, Kans., to take on Tennessee State, Michigan and Kansas State. Tech will then host Georgia, Georgia State and Kennesaw State for the Georgia Challenge on Sep. 8–9 and end four weeks of tournaments at the Coastal Carolina tournament on Sep. 16–17. The Jackets do not see many ACC matches during the first few weeks, but there’s no doubt that the conference competition will be tough this year. Looking to rise from the ninth spot, Tech will need consistent, superb performances on the court. They have all season to prepare for their matches against Louisville and Florida State, the first and second ranked teams in the ACC, but that doesn’t mean that the season will be easy going until that point. Matches against North Carolina and Pittsburgh, both teams also ranked above Tech, are scheduled for mid-season along with many other ACC competitors. Rivals Virginia Tech and Duke will also meet the team on the court this season. The Jackets defeated the Hokies and the Blue Devils on the court last season with at least a solid two point lead in each match. After a spring packed full of team building at home and abroad, the Jackets have an arsenal of new tools to help them go further on the court this year. The home campaign for the Jackets starts versus Pacific, an Oregon college, on Aug. 27 at O’Keefe Gymnasium.